Nebula can be advanced and its rez cost is lowered by 3 for each advancement token on it. He bent his bow of stellar matter. No Bad Publicity cost to rezzing. Adds threat to advanced ice. May stick out like a sore thumb if you're playing a scarce few advanceable ice. Note that the value of Bad Publicity depends on your asset & icing strategy. Using binary ETR ice (e.g. Ice Wall/Quandary), and rushing stuff out early? Bad Publicity probably doesn't matter, and Grim is a good pick. Anything else? Consider something else. Potentially more tricks with advancement manipulation, especially in Blue Sun: Powering the Future or Tennin Institute: The Secrets Within. Can be used in combination with Lycan for better bluffing. Costs up to 3 more. Strength 3 -> 5 is a big jump for sentries, especially in straining Mimic, Femme Fatale, Alias and Pipeline. Interestingly, they synergize with each other for the purposes of bluffing. Archer is the only Destroyer at the moment with higher strength (at great cost.) +2 strength usually means at least +2 to break. Grim | Has been used to great effect in quick binary ETR decks to keep it active and the runner in lockdown. Lycan •• | The biggest advantage here is that it can become a code gate, which is huge, and means you can take out their sentry breaker with it. However, it has a lower strength. Note that you can use them side by side to good effect - advancing an ice once leaves them guessing: Are they threatening a Code Gate, or a Sentry? 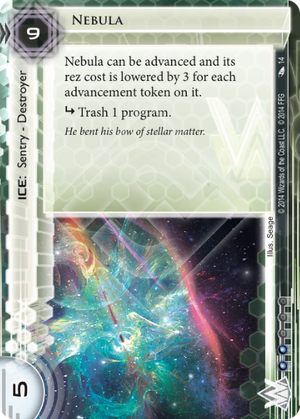 Also consider that Wormhole is an advanceable Code Gate that can trigger pre-rezzed trash-routines with an insane 7 strength, and the same exact cost of Nebula. Rototurret • | Cheaper and ends the run... but at 0 strength a twig breaker will stop it, and a Parasite will kill it instantly. Lancelot • | Costs neutral influence, meaning Weyland thinks twice, but less for others, still the strength is fairly low. Most decks that go grail go all-in, so you probably already know if you're using it. Sagittarius •• | If you're HB this is a decent alternative. Slightly weaker and relies on a trace, but if the routine fires, you can guarantee you hit at least one program with 3. Ichi 1.0 •• | Again, if you're HB this is worth considering. A great taxing ice threatening the same effect. Often you can get it to fire once before it becomes a tax to pay. This is used in decks of the opposite archetype as those for Grim. Ichi 2.0 ••• | Everything that was good about 1.0 is amplified in 2.0, but at a higher cost. Still, if you were willing to pay for Nebula, Ichi 2.0 falls in the same range. But, it costs 3 influence outside of HB. Overall, it's an interesting ice, with it's own situational uses. Haas-Bioroid is unlikely to give it a moment's notice, and Weyland will debate between it and Lycan (but potentially include a mix of both.) Jinteki and NBN may not think much of it, outside of Trick of Light decks, given the plethora of other options and small upside for the cost.